If you search your ancestors in Roccasecca, Lazio, info about your Italian family are stored in the City Office archives or at the parishes. In towns and villages of Lazio and in Frosinone province registry offices were established in early 1800: it means that you could find information in Roccasecca registrar as of that date. So, if your ancestors were in Roccasecca in the nineteenth or twentieth century, then you could try to contact the City Office of Roccasecca to know more. Before to start your genealogy research in Roccasecca, we suggest you to read our tips for your search . They are useful to search in Lazio and in Roccasecca too. 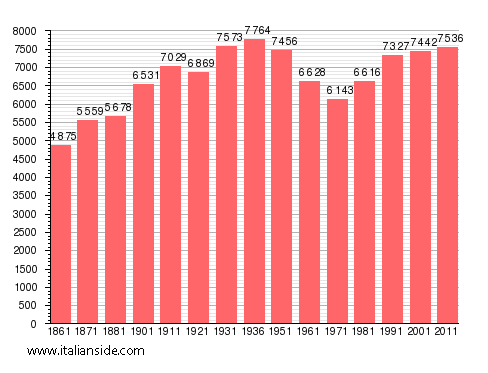 Next picture shows the demographic trends in Roccasecca from the Italian Unification (1861) an important info to understand how many people lived there in the past. It could be important to know if the last name you are investigating is a frequent surname in Roccasecca. As more your surname is common in Roccasecca, as more it could be difficult to find the right info about your ancestors in Roccasecca archives if you have not exact dates. If you have the opportunity to visit Roccasecca and Frosinone province, you could plan to investigate churches’ archives by yourself, but from abroad is very difficult to obtain any result unless you find a reliable local help. If your research is in a dead end and you need professional help from our local Italian genealogists write to roccasecca@italianside.com our expert in Roccasecca area will study your request and will reply to you with a research plan and a quote. MY FATHER MARIO LEONE WAS BORN AUGUST 15, 1917 CAME TO AMERICA IN 1935, I WILL BE COMING TO ITALY IN MAY 2018, IS THERE A WAY YOU COULD FIND OUT WHAT ROAD AND HOUSE NUMBER IN ROCCASECCA THAT HE LIVED IN. My great-grandmother (Assunta Rizzi/Ricci) was born in “Roccasecca, Caprile” on May 28, 1883. Can you help me get additional information, such as the names of her parents and/or siblings? Rocco Molle born abt 1898 in Roccasecca was my Grandfather, he was the son of Bernardo Molle and Piamfilia Ciamberlano they emigrated to Northern England when he was a little boy. Clelia and Rocco married in April 1925 in Colle san Magno and emigrated to northern England. I still have cousins in Caserta with the Molle surname. Ciamberlano is an unusual surname and there are not many of them. HI..I’ve been looking for relations called Molle in both Roccasecca and Colle San Magno. I visited both places in the 1970s and met various relations. One was a Maria Cerro who lived in Roccasecca with her husband and the other was Ermalinda Molle who lived in Colle San Magno. Anita, I also have a Ciamberlano ancestor connection to the Roccasecca / Colle San Magno area from around the same time. My great-grandfather, Orazio, and one of his brothers, visited a third brother in Northern England who had relocated there previously. The two brothers left Liverpool for Philadelphia in 1898, I believe, and each settled in New Jersey. My great-grandmother, maiden name Testa, was also from the same area. Ancestry records I’ve located are minimal, but I hope to connect with others who can help me find out more. It is believed that my grandmother’s family moved from Roccasecca to Nettuno in the early 1900’s. Her name was Rosa Chocci. Is there any place I can check for a record of her birth and her parents? Maiden name Capone. and she Married Rocco Molle who was already in UK and went back to Italy to choose a wife about 1920. Rocco was born in Roccasecca Italy. Looking for details on parents/grandparents/siblings of Luigi Marcuccilli, born 27 Mar 1887 Roccasecca and Anoria/Onoria Bove born R. in 1887. I know this was two years ago. Did you ever find any information? My last name is Marcucilli. When my family came over from Roccasecca immigration dropped one of the C’s. My great aunt was Mary Costello (my grandmother’s sister) – she was born in Mass. to Irish parents in 1893. Her husband was Guido DeVito (could be spelled Divito). On his WWII draft card, he listed Roccasecca as his birthplace (June 2, 1890). His parents were: Vincenzo (Vincent) J. (James?) Divito, 1865-1930 and Filomena (Ph?) Viola, 1863-1930 (he and his parents came in 1900). They both died in Mass. in 1930. Looking for information on genealogy of the Pirro family from Roccasecca. My husband’s grandfather was Antonio Pirro, married to Angelina. Uncle Luigi and Aunt Teresa Pirro were their two children who we believe were born in Roccasecca. Any hints at all would be greatly appreciated. Antonio, Angelina and Luigi came to the US before 1914 and settled in Yonkers. Teresa did not leave Italy until much later; no one knows why she stayed or who she stayed with. Thanks. My grandfather, Americo (Albert) Pirro came from Roccasecca with his brothers in 1914. He settled in Yonkers. He was married to Michelina (Margaret) Pirro. Would like to compare soe search notes. Hi Tony, I guess I should check back here more often!! Cousin Linda and I are in contact and are working on our family connection. My husband is the “Pirro” but I am doing the family tree. Thanks to Linda, I have your grandfather Americo in my tree, son of Alesandro and Stella. My husband’s grandfather, Antonio, was the son of Luigi and Catarino De Vito. Linda and Jeanne were very instrumental in discovering what happened to Antonio, who suddenly disappeared from all records in 1918. Now that I have entered everyone from Linda’s tree into mine, my tree is HUGE. It’s impossible to see exactly how we are all connected on one screen but I believe it’s third cousins, maybe several times removed. I’m pretty sure Linda figured it out but I can’t find her e-mail. I’d be happy to share what I have with you, Tony, so I promise to check this location again soon. 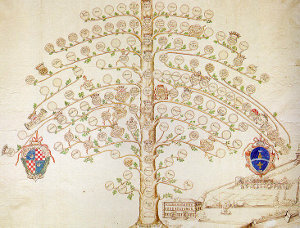 Mary I have a family tree for the Pirro Family. In order to connect your family to mine I need more info on Antonio and Angelina. Tony who replied to you is related to me. I am looking for any evidence of whether My family started in Roccasecca or Cassino. I am of the Paglia famiglia. I know that they lived in Roccasecca and cassino, but did they originate there. My fathers side of the family was Paglia and also from Cassino and/or Roccasecca. Trying to find ancestors of my great Grandfather Tommaso Forte born Roccasecca 1874.Son of Lorenzo Forte and Francesca Incagnoli.He had two older brothers Guiseppi and Giovani.Both brothers went to the USA and settled in Trenton New Jersey.I believe they both became police officers.I would imagine they arrived in the US in the early 1900,s.I have no idea how I would begin to trace them .As I dearly want to find Francesca,s family . I am looking for the family of Maria Cerro who was living in Roccasecca during the 1970s. she is related to my Grandfather, Alfredo Molle, whose own grandfather?, Tomasso Molle lived there during the late 19th century. Tomasso Molle was my dad’s cousin. He was married to Matilda and they have two daughters who married brothers. Sadly, Matilda and Tomasso passed away and my Dad passed this October. I do not know if they are the same Molle’s, as there are others in the city. My GreatGrandfather Was a Tomasso Molle, I know quite a bit about him when he moved to England and later settled in Scotland and the many children he had. We have no information as to why he left Italy and his family there. From that Bloodline we believe that we are the last of the men carrying his Molle surname. To my knowledge he had a daughter francesca in Italy and possibly a second (spelling maybe wrong) and was probably married, but later ended up landing in liverpool. We know he also served in the army Alpine unit and have manged to get in contact with some wonderful long lost family who moved to Canada who kindly gave us a photo of him! Jaqui Perrio was Alfred Molle granddaughter, is that you? Bobbie, I have tried leaving a message before but it seems to have disappeared. I think we may be from the same family as I sent my cousin in Canada a photo of Tomasso Molle in Alpine army costume. Are these cousins in Montreal, Canada? I am related to a Tomasso Molle from Roccasecca. His parents would have been Francesco Molle and Liberia Coggio. I also have a bit of that family tree if you are interested. As far as I understand, our family in Doncaster (My grandad came from Edinburgh) are the last household that still holds the Molle Surname. My family is having trouble locating the ancestors of my grandfather Tommaso DeMaula and his wife Maria Baccari. They are both from Roccasecca. We heard that his last name may have been misspelled upon arriving in the U.S. years ago. They are now deceased for many years. I noticed that there was a Tommaso DeMeiola from Roccasecca and wonder if that was his true name. In any event could you check to see if there is record of them and possibly provide the names of ancestors on both sides? If you would like to start a research in Roccasecca please send your request to roccasecca@italianside.com.